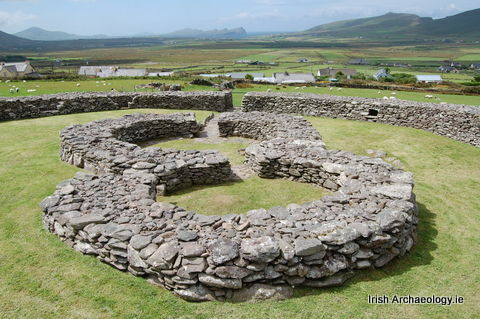 Located in the shadow of Mount Brandon and overlooking the Atlantic Ocean, Cathair na BhFionnúrach is situated on the very western edge of Europe. Accessed via an old, grass covered laneway, the fort consists of a circular, stone-walled enclosure, approximately 29m in diameter. 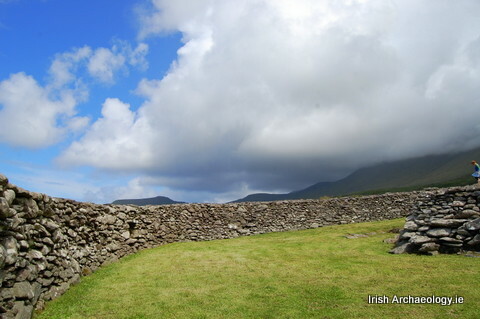 Originally the home of a Gaelic noble or wealthy farmer, it has stood sentinel over this remote part of the Dingle peninsula for more than a 1000 years. 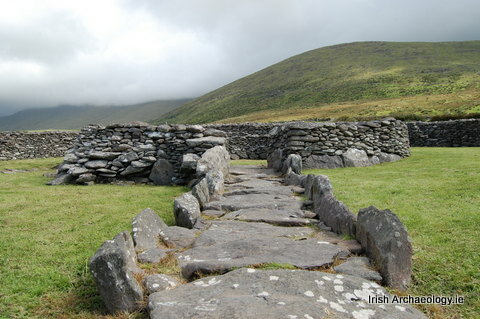 Known locally as Cathair a Bhoghasin, which translates as ‘fort of the rings’ or possibly ‘fort of the rainbow’, the site has been archaeologically investigated twice. Firstly in 1893 when William Darcy carried out a poorly recorded excavation, which unfortunately we know very little about. Thankfully the second phase of work at the site was more productive. Carried out between 1994 and 1997, under the direction of Erin Gibbons, this archaeological excavation revealed a wealth of information about the site. 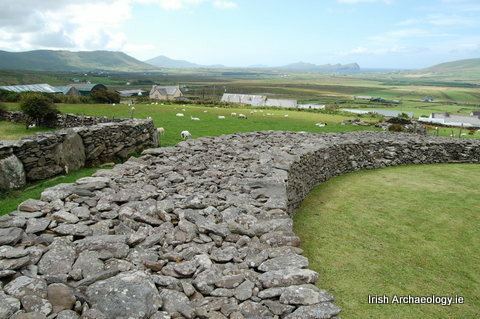 Today the fort is defined by a substantial wall, which survives to a maximum of 3.5m in width by 2.5m in height. Constructed of un-mortared stones, which are randomly coursed, the wall has at least seven sets of steps along its internal circuit. Originally these would have given access to a series of wall terraces upon which the inhabitants of the fort would have stood to repel attacks. The enclosing wall originally contained two chambers within its build, but now only one survives. This room is accessed from the interior of the fort via a low, lintelled entrance, which allows entry into a relatively spacious room, that can hold up to twenty people. The original function of this wall chamber remains uncertain but it is possible that it was used as a safe room during attacks or else as a storage area. The entrance into the fort faces west and is defined by a gap in the wall, which measures approximately 1.4m wide. 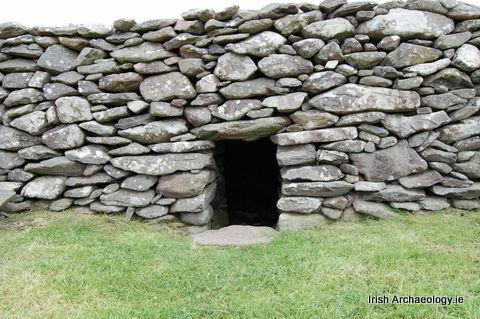 This narrow entry point is flanked by stone jambs and may originally have been lintelled. It was probably defended by a sturdy wooden gate that hung on a large post, evidence for the latter being uncovered during the 1990s excavation. The interior of the fort is dominated by the remains of a large, stone house, which is figure-of-eight shaped in plan. 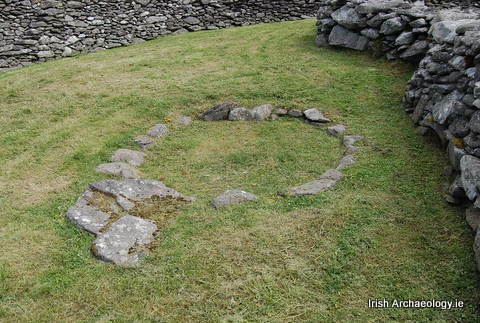 It consists of two circular, co-joined rooms that are linked internally by a doorway. The larger, western room measures circa 6.5m across and was originally heated by two internal hearths. It also contained a number of pits, probably used for storage and waste disposal as well as a series of post-holes, some of which were stone-lined. These posts probably supported a thatched roof, while some may also have defined internal divisions. Finds from the interior were scant, but did include a polished stone axe and an anvil stone. The latter may have been related to a small iron smelting furnace-pit which was also identified within the house. The second, smaller room measures circa 4.5m in diameter and was accessible from the first room via an internal doorway. It also contained a second entrance along its northern side, which gave access to the exterior of the building. Internally the room contained a hearth, numerous postholes and significantly the remains of a souterrain. A souterrain is a man-made, underground passageway that often contains additional sunken chambers and rooms. These structures appear to have been used as places of refuge in times of danger and also for storing perishable foodstuffs (an early type of fridge). 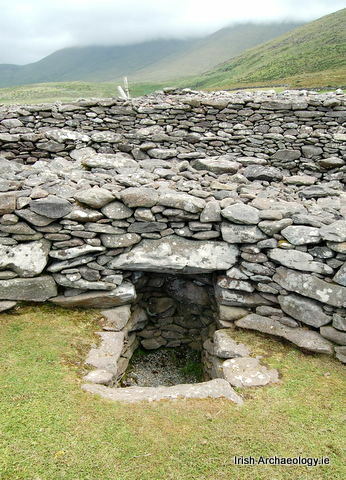 The souterrain at Cathair na bhFionnurach is a accessed via a stone-lined pit in the floor of the smaller room. 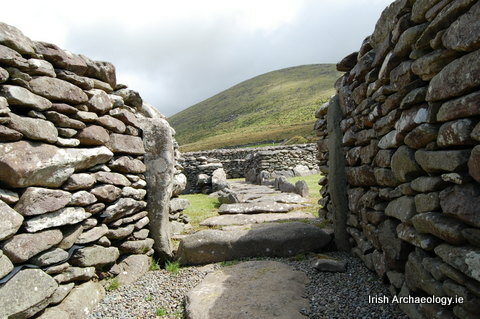 This leads, via an earthen ramp and stone steps, into a sunken chamber defined by stone walls and roofed in large stone slabs (access to the souterrain is currently restricted by an iron grill). 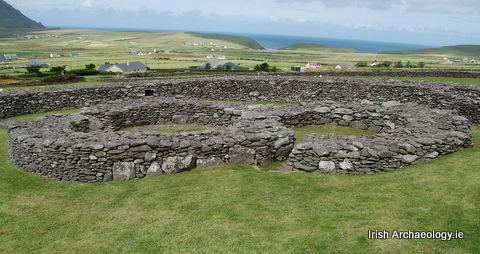 The inhabitants of the fort appear to have used a large cess-pit located immediately to the north of the figure-of-eight shaped house as their main toilet. This substantial pit measured circa 2m wide by 1.9 deep and was partially stone-lined. It was filled by a series of waterlogged deposits that contained extensive organic remains. These included material such as straw, grass and flax, which may have been used as rudimentary toilet paper, as well as more direct evidence for human waste in the form of faeces. Various fruit seeds were recovered from the pit and these probably represent food waste. They included native species such as apple, blackberry and hazelnut as well as an exotic imports, such as grapes. A number of wooden artefacts were also recovered from the pit and these included a chamfered length of wood, a lid containing a mirror inset and two fragments of a platter or plate. Other artefacts uncovered during the excavation included strike-a-lights (for lighting fires), spindle whorls (for spinning wool), iron knives, glass bead fragments, crucible fragments, iron slag, a lead weight, an iron saw fragment, B-ware type pottery and two Henry III pennies of mid-13th century date (B-ware pottery is an imported ware from the Mediterranean region which normally dates from the 6th century AD). 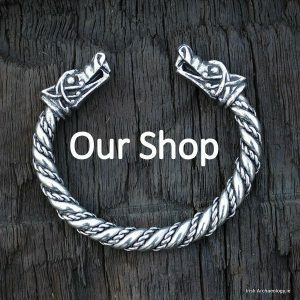 Most likely the home of a local noble, the wide range of finds from the fort suggests that it was occupied, at least intermittently, from the 6th to 13th centuries AD. 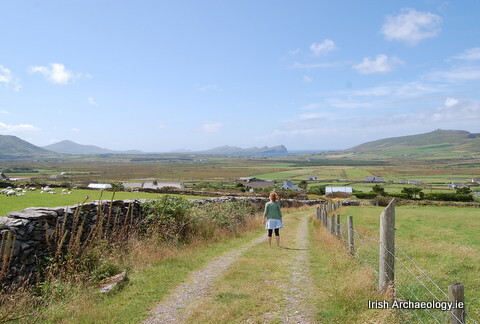 Located in the heart of the Irish speaking, West Kerry Gaeltacht, Cathair na BhFionnúrach is well worth a visit. 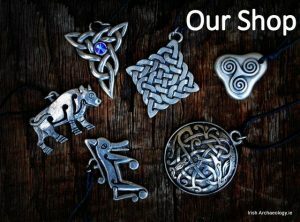 Great work Colm, top post and super images. So enjoyed this, fabolous post, thank you. What are the directions to this site? in May and would love to explore this area. Great post! 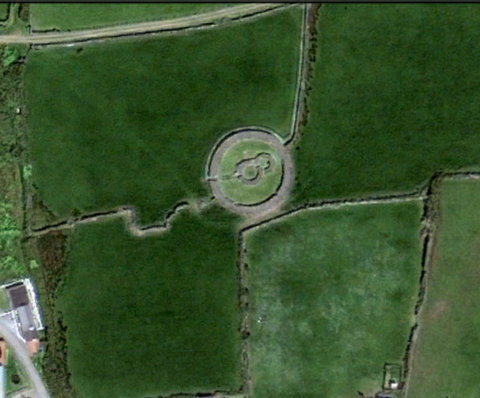 I’ll be travelling to Dingle next week and look forward to visiting this site. Thanks!